The audio merger splitter in Reason is a utility device which routes audio devices. Ideal the Audio splitter is used for parallel audio processing, while merging is similar as using a mixer with out having control on the volume. With having a larger article about the CV Merger & Splitter in Reasoner I can be really short about the Spider Audio Merger & Splitter. Since it works the same way as the CV Merger & Splitter but the audio variant only re-routes Audio signals (the main audio output of a device). 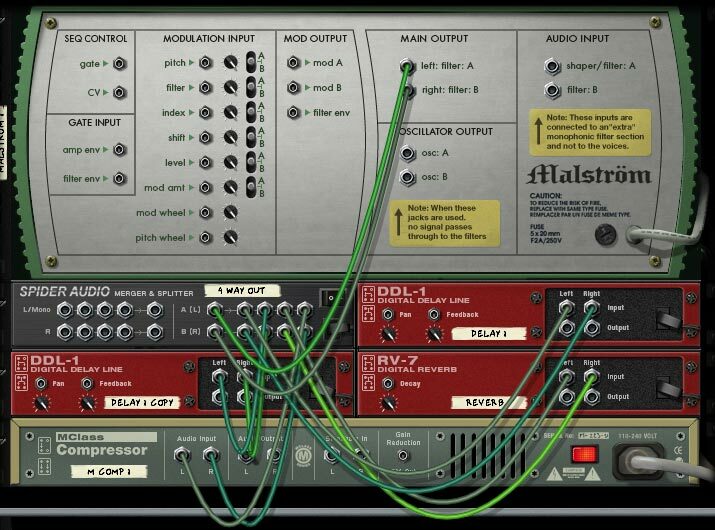 While in a way the Audio merger splitter was handy with using a Combinator patch to connect all the other devices to each other by using the splitter, the Audio merger kind of became obsolete with having a Line Mixer 6:2 in the reason Rack. Still there are some nice techniques that you can apply to use this device. Especially the split function can create these really dynamic sounds while having only one devices that triggers the notes. As I have already mentioned, the merge signals are kind of obsolete, since there are different devices inside the reason rack which do the exact same function but with more precision and control. However, if you want to bind the audio signals together without tweaking volume knobs, then the spider audio merge section can come in handy. The merge segment has 4 input slots and 1 output slot. The second part of the Audio merger splitter (which is called split audio) still has its applicable usages. Since in a way you are able to use one dry signal and therefor connect it to multiple effects using the same dry signal. A similar effect would be called Parallel Audio processing (which is different then serial Audio processing). Lets kick this into high gear and start with an example on what you can do with splitting the audio. In this example I am going to use a subtractor. The first subtractor has a splitter inside of it which is connected too 2 different phaser units. Each phaser unit has its own rate making it really dynamic in a way. For the second effect, the bass-line, I added 2 different unisons connected to the splitter, which leads into a real nice stereo effect by panning one signal to the left and the other to the right inside the main Remix Mixer. In other words, you can send one signal to the splitter, reroute it through 2 different devices and create 2 unique sounds just by using one device. So there you have a comparison on what actually happens when rerouting the signals separately and join them together separately. This concludes this short tutorial about the Spider Audio merger and splitter! Part of it went wrong while migrating the content from the old platform to the new one. I have already replaced the images. I'll check tomorrow where the audio files went off too.